Here at Root Beer Revelry we offer a large variety of bottled gourmet root beer & soda. All of our bottles are priced the same, allowing you to mix and match four-packs, six-packs and cases! We offer ice-cold bottles of root beer in our cooler as well as on tap. We also serve root beer floats using only the best ice cream. 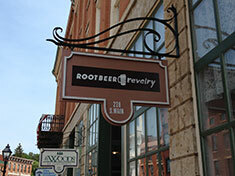 So stop into Root Beer Revelry and start a new tradition on Main Street Galena. You’ll be amazed with the flavors! Your one-stop shop for flavored, colorful, organic and gluten free pastas. Hundreds of novelty shaped pastas including college teams and holiday pasta. Fancy Italian, hearty German and fun American pastas. Unique sauces and pasta kitchen accessories too! Specialty shop for your fur babies and animal themed products for you! New Earth Animals sells American made, high quality, affordable pet foods, treats, chews, toys and supplies. We also offer gentle-care Grooming, Doggie Daycare and Pet Sitting at our facility just one-mile from downtown. 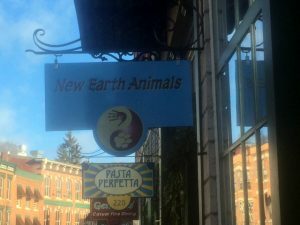 New Earth Animals has created a warm and inviting pet atmosphere that is a regular gathering place for pet lovers and their four-legged furry friends. The shop owner, Gail, is a veterinary technician with 25 years of experience. Her background allows her to choose products to carry in the store that are high quality, safe and interactive for your dogs and cats.